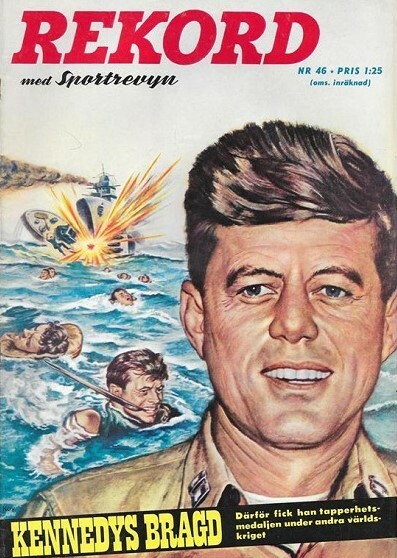 1967 hade Rekord John F Kennedy på omslaget. Rubriken löd ”Kennedys bragd” med texten ”Därför fick han tapperhetsmedaljen under andra världskriget”. Tidskriftsomslaget: Rekord med Sportrevyn, nr 46, 1967. 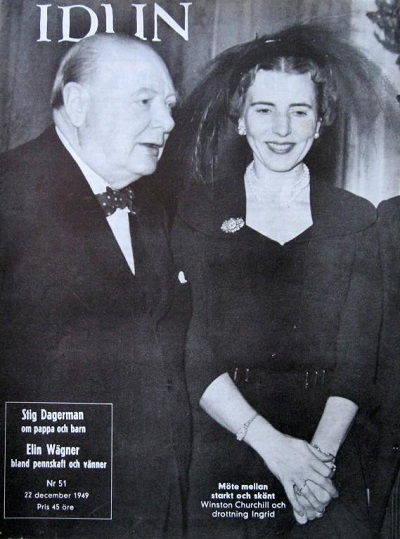 ”Möte mellan starkt och skönt” är bildtexten på omslaget av Idun (nr 51, den 22 december 1949) när Winston Churchill möte drottning Ingrid. Pris: 45 öre. Arkivet: En intervju med Winston Churchill! HISTORIA | Dagens politiker låter sig gärna intervjuas av journalister. Intervjuer har blivit ett medvetet sätt för partierna att få ut sitt budskap till allmänheten. Därför medietränas politiker hårt för att klara en intervju och undvika journalisternas fällor. Samtidigt ingår intervjuteknik i journalistutbildningen. Så har det inte alltid varit. Förr intervjuades inte politiker speciellt ofta. Och eftersom de möttes med större respekt än idag behövde de inte heller förbereda sig lika minutiöst som idag. Skjutjärnsjouranistik är ett förhållandevis nytt fenomen. Men en fördel med den gamla stilen var att politikern ofta hade möjlighet att formulera sina tankar kring komplexa problem. Men trots detta är det inte från intervjuer vi fått vår bild av politikern Winston Churchill. När vi tänker på politisk kommunikation i förhållande till Churchill handlar det oftare om hans tal och retoriska förmåga. Även ikonen Churchill – t.ex. hans bulldogsliknande framtoning – är tydligare för eftervärlden än hans politiska åsikter. Än idag står han som den stora symbolen för motståndet mot Adolf Hitler under andra världskriget. Det är därför inte direkt den nyanserade politikern vi minns. Men läser man Kingsley Martins intervju med Churchill i New Statesman, åtta månader innan världskrigets utbrott, är det just den bild som framträder. Han är både principfast och klartänkt. Han är en övertygad demokrat och långt ifrån den reaktionära konservativa politiker nidbild som så många revisionister har velat framhålla efter hans död. Han talar initierat om de demokratiska och fascistiska staternas väsen. Och han är väl medveten om att de demokratiska rättigheterna riskerar urholkas om Storbritannien överreagerar för att skydda samhället mot i kampen mot ett totalitärt hot. När han svarar på intervjufrågorna handlar det inte om några utslätade politiska ”talking-points” eller klyschor. Kingsley Martin The country has learnt to associate you with the view that we must all get together as quickly as possible to rearm in defence of democracy. In view of the strength and character of the totalitarian states, is it possible to combine the reality of democratic freedom with efficient military organisation? 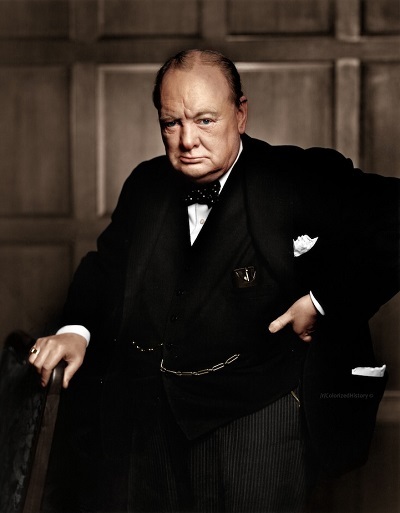 Mr Winston Churchill The essential aspects of democracy are the freedom of the individual, within the framework of laws passed by Parliament, to order his life as he pleases, and the uniform enforcement of tribunals independent of the executive. The laws are based on Magna Carta, Habeas Corpus, the Petition of Right and others. Without this foundation there can be no freedom or civilisation, anyone being at the mercy of officials and liable to be spied upon and betrayed even in his own home. As long as these rights are defended, the foundations of freedom are secure. KM One point people are especially afraid of is that free criticism in Parliament and in the press may be sacrificed. The totalitarian states, it is said, are regimented, organised and unhampered, as the Prime Minister suggested the other day, by critics of the Government “who foul their own nest”. WC Criticism may not be agreeable, but it is necessary. It fulfils the same function as pain in the human body; it calls attention to the development of an unhealthy state of things. If it is heeded in time, danger may be averted; if it is suppressed, a fatal distemper may develop. KM Do you attribute the slowness in preparation of which you complain to any inherent defect in democratic institutions? WC I am convinced that with adequate leadership, democracy can be a more efficient form of government than Fascism. In this country at any rate the people can readily be convinced that it is necessary to make sacrifices, and they will willingly undertake them if the situation is put clearly and fairly before them . . . It may be that greater efficiency in secret military preparations can be achieved in a country with autocratic institutions than by the democratic system. But this advantage is not necessarily great, and it is far outweighed by the strength of a democratic country in a long war. In an autocracy, when the pinch comes, the blame is thrown upon the leader and the system breaks up. In a democratic country the people feel that they are respon­sible, and if they believe in their cause will hold out much longer than the population of Dictator States . . .
KM People who are not necessarily pacifist are horrified at the idea that we may go into another war with the same kind of generals who were responsible for Passchendaele and other horrors in the last war. They say that they might be prepared to fight for democracy if they were democratically led; but that they are damned if they will be sacrificed again for the Camberley clique that was so horribly inefficient and wasteful in the last war. Do you think it is possible to democratise the army? WC It is quite true, I know, that many people consider that the cadre of officers is selected from too narrow a class. I have always taken the view that merit should be rewarded by promotion in the army as in any other profession. I support this not only from the point of view of democratising the army, but mainly because I think it leads to efficiency such as no other system can achieve. KM May I ask one more question of a more general character? Most of us feel that if there is a war it will be so destructive that the very substance of our civilisation, let alone our democracy, is likely to be destroyed. Clearly the great object is to prevent war. Is it possible in your view still to regard these military preparations, not as the acceptance of inevitable war, but merely as a necessary complement of a policy which may keep the peace? WC I fear that failure to rearm Britain is bound to lead to war. Had we strengthened our defences earlier, the arms race need never have arisen. We should have come to a settlement with Germany while she was still disarmed. I think it is still possible, with a strong Britain and France, to preserve the peace of Europe. KM Is it not true historically that an armaments race leads to war? WC To say that an arms race always leads to war seems to me to be putting the cart before the horse. A government resolved to attain ends detrimental to its neighbours, which does not shrink from the possibility of war, makes preparations for war, its neighbours take defensive action, and you say an arms race is beginning. But this is the symptom of the intention of one government to challenge or destroy its neighbours, not the cause of the conflict. The pace is set by the potential aggressor, and, failing collective action by the rest of the world to resist him, the alternatives are an arms race or surrender. War is very terrible, but stirs a proud people. There have been periods in our history when we have given way for a long time, but a new and formidable mood arises . . .
Läs mer: En intervju med Churchill i The New York Herald den 2 februari 1915 när han var First Lord of the Admirality. Arkivet: 800 000 dokument om Winston Churchill! 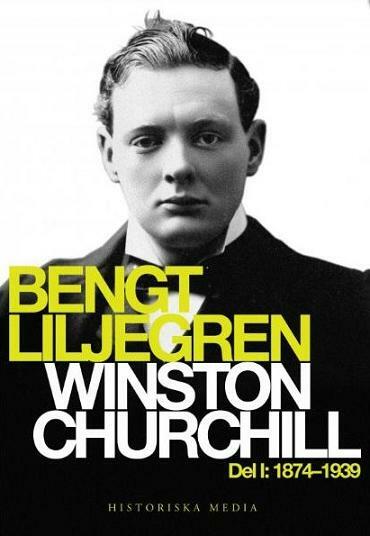 FORSKNING | Första delen av Bengt Liljegrens biografi över Winston Churchills liv har nyligen kommit ut i bokhandeln. Och fler böcker kommer det snart att bli. 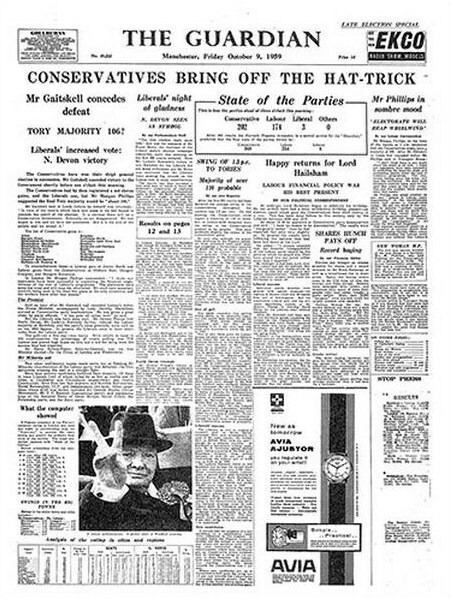 Detta eftersom det har blivit enklare att forska sedan Churchills personliga arkiv, som förvaras i Churchill College, Cambridge, nu har digitaliserats av firman Bloomsbury Publishing. Bloomsbury has published the entire archive, almost one million documents, in digital format for university libraries, public libraries and schools to access on demand. The content of the archive has been made available to a global audience who will be able to study one of the largest and most important collections of primary source material of any individual leader in history. It includes more than 800,000 pages of original documents, produced between 1874 and 1965, ranging from Winston S. Churchill’s personal correspondence to his official exchanges with kings, presidents, politicians, and military leaders. This is more than a fantastic collection of primary source material; it is a unique online resource offering new insight into a fascinating period of our past. Ännu är det inte möjligt för privatpersoner att komma åt dokumenten. Däremot är arkivet tillgängligt för bibliotek och forskningsinstitutioner.